I arrived in London almost a week ago with my 20 year old daughter. We settled into our 3 story 2 bedroom 2 bath Airbnb in Knightsbridge, London just a short walk from the famous Harrods Department store. We scouted out good restaurants, the Underground train, and shopping pretty quickly. And I found a wonderful cafe for our morning coffees, the Caffe’ Nero. I have discovered a new drink there, the double Ristretto con panna , which roughly translates to 2 espresso shots with whipped cream. The Ristretto is made with half the amount of water and a finer grind of coffee to make an even stronger shot. I have easily adjusted my sleep schedule to sleep in and stay up later. I used to come here as a child as my parents are from England. We used to stay with different relatives. I remember my uncle John had a Rowhouse, which is kind of like a condo, except taller and skinnier with extremely steep stairs. I remember the musty smell of the old furniture in his house, awkwardly playing with my cousins and driving around with my parents in the misty rain seeing other relatives. In coming back here so many years later nothings seems the same to me. In fact the only thing that I have found so far to be the same is the soft serve vanilla ice cream cone with the chocolate flake stick in it that they serve in most touristy areas. They still serve it. When we were out one day shopping, I saw the little ice cream truck and I said to my daughter, “We have to get one, I loved these as a kid”, I went up to the truck and with a huge smile on my face and asked for one. The lady looked smugly at my smiling face and said it wasn’t ready yet. Oh yeah, English people frown upon too much enthusiasm. I do remember that now. So, I waited patiently a good amount of time, and then I went back over to the truck and asked this time with less enthusiasm, ‘Can I have the ice cream now?’, and there was a slow nod to the negative. I gave up. My daughter consoled me and said I probably would find another stand that offered it, and I could get one later. I felt like I was about 5 years old as I walked away. Now, this is the England I remember, it was all coming back to me. The next day we went to the Tower of London, where along with seeing the Crown Jewels, we stood in the Bloody Tower. This is where the reigning King or Queen 100s of years ago, would bring their enemies and lock them up, and torture them. We learned of one man who lived in this small stone space thinking that he was going to be executed on a daily basis but ended up dying of dysentery after 10 years. We learned of a young girl of 16 who was part of a plot for her relative to obtain power, and was brought to the tower under the pretense of getting married, only to be beheaded after 9 days. And finally we learned of 2 young boys, only 9 and 12 who were the sons of a King who should have eventually inherited the throne, but mysteriously disappeared on the grounds, never to be found again. This is part of English history, so technically my history since I am English. I thought of my parents growing up not too far from London, not too far from this Tower. The English history and way of life did not resonate with them, and they left England when they were just 25 years old and immigrated to America. My father believed there would be better work opportunities for him. In my parent’s day in England, if you were born to a certain class then it was hard to move up and rise above where you were born. There is a picture of them coming across on a large passenger boat, sitting with hopeful smiles as they travelled the sea to come to America. They left everything behind and started a new life. I have inherited their daring sense of adventure, and their ability to pick up and start again. Because of their actions, I am able to provide a better life for my daughter. 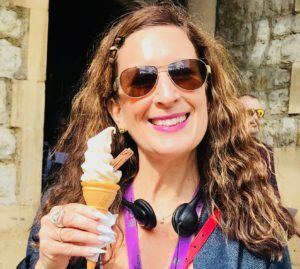 I was thinking of their courage as I walked around the Tower of London, and walked into a courtyard that had souvenirs and snacks, and it had a little snack stand serving my soft serve ice cream with the chocolate flake. My second chance to have one so I got in the line, or as they say in England the ‘queue’. My daughter waited patiently with me as I saw other’s getting ice cream, but they didn’t have the chocolate flake stuck in them. Huh? Then it was my turn. ‘Do you have the crisp?’ I asked, meaning the chocolate flake. ‘Let me translate,’ said the surly server, ‘Crisp means potato chips’. She stared at me waiting for my response, as if I had purposely insulted her. ‘No,no,no,’ I said, ‘the chocolate, for the ice cream’, I pointed to the picture ‘that thing you stick in there’. She was exasperated with me, ‘the flake?’. ‘Yes, I want the flake’. I wanted the full experience of the ice cream, and that was part of it. ‘Are you sure?’ she said to me more with her eyes than her mouth. ‘Yes, I want the flake’, I said a little too loudly. She took her time swirling the soft serve ice cream onto the little cone (about half the size of a cone we use in America), and then grabbed a small napkin and opened a cardboard box and got my flake and stuck it in the side of the soft ice cream. Got it! I grabbed my ice cream and walked away with pride. As I walked around the grounds with almost 1000 years of history around me, I thought of all the brutality and suffering that my ancestors endured before me. It is because of their sacrifices that I can now walk leisurely around these grounds, with a contented smile on my face eating my ice cream exactly how I want it.